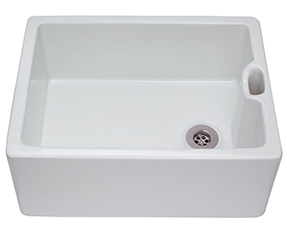 The KC73WH is a designer ceramic single bowl sink. It is made from handmade fireclay and is naturally hard wearing to withstand tough use in the kitchen, complementing your modern kitchen perfectly. 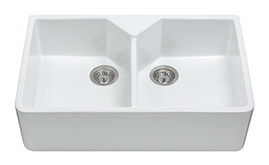 The KC74WH is a designer single bowl ceramic sink. It is made from handmade fireclay and is naturally hard wearing to withstand tough use in the kitchen, complementing your modern kitchen perfectly. Smooth, easy to clean, heat proof and finished by hand, our ceramic sinks look stunning against worktops and chrome or brushed nickel taps. Our ceramic sink range is made from hand fired clay and this material has many coveted natural properties. The glazed finish makes them naturally stain and scratch resistant while the ceramic material is heat resistant and suitable for pans and oven trays. Often seen in traditional kitchen designs, these sinks lend themselves to the hardworking baker’s kitchen or the family home where Sunday roasts are a time for everyone to gather together. We have created models with a single bowl and a draining board or a bowl and a half design with draining board for extra room to drain and pour liquids in the centre. These are both practical and hardwearing sinks. There are also undermount ceramic sink designs for kitchens looking for uninterrupted work surface lines. Ideal in an island unit or as an extra sink space for practicality, these models come in two sizes to ensure that you have the flexibility to create the exact kitchen workspace you need. We even do a range of modern styled ceramic taps with smooth instead of ridged drainers. The KC73 and KC74 offer an updated ceramic sink design in either a single or bowl and a half design.You can have the best of both with the smooth white, hardwearing design and a modern finish to the kitchen. Our Belfast models add a traditional touch to the kitchen, with the KC10 featuring the familiar side overflow weir and a deep bowl that is synonymous with the look. The Belfast range does not feature a draining board, as is in-keeping with the design of this style, but we do offer a large single bowl or double bowl design for deep space in the sink for washing up, draining, filling, and simply looking fantastic. The Belfast design looks stunning when combined with a TT50 or TT56 traditional style tap. The spout being directly over the centre of your sink for easy pasta water, hand washing and vegetable preparing. Ceramic is also very easy to clean as dirt just simply doesn’t stick to the glazed surface. A quick wipe down with a cloth and some household cleaner will clean up spills and dirt, leaving a sparkling white finish. All our sinks come with strainer wastes as standard. These are ideal as they work as an effective plug when depressed and pushed into the plug hole but also as a sieve for your plumbing when they are pulled upwards to sit in the plug hole without a seal. Collecting vegetable peelings, food particles, dirt and anything else that you don’t want to slip down the plug hole to cause a blockage these are useful bits of kit to have in order to keep your kitchen flowing smoothly. It is important to be aware that, due to the handmade nature of the ceramic range, you can expect to see slight variations in shape, surface and size. Although minute, these variations are natural and part of the beauty of the product. The ceramic range deserves to stand out as a feature in your kitchen. Choose a corresponding bridge or swan neck tap to make the most of the design and accompany it with granite style or wooden worktops to complete the look.